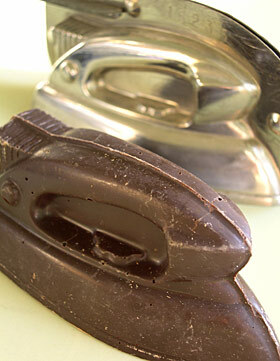 A while back I found a rare 50’s vintage chocolate mould in the shape of an iron. It has been on my mantelpiece ever since but with Christmas coming and this being the season of chocolate-shaped novelties I decided to give the mould a dusting down and make some ‘cool irons’. The drawback is that with only one mould I can only make one iron at a time which then has to be left till completely set before being released. As luck will have it, I contacted Julia Morgan from the British Iron Collectors Club who by some miracle also has one of these moulds in her extensive iron and laundry related collection which she has been prepared to lend me. OK, still not exactly a production line but output has now been increased by 100 percent! I have got a few other really lovely vintage chocolate moulds for sale which will soon be added to The Laundry’s vintage pages. Will keep you posted. 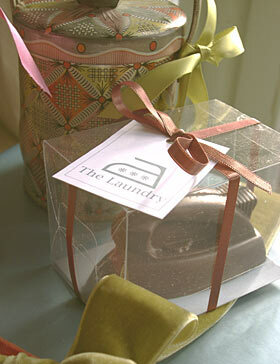 The chocolate iron looks great! It’s so funny that you have started a blog.I was just going through my emails and found one you sent me last year where you mentioned you might start one if you had time.I came over to have a look in your shop and found your blog! Ah the kind of appliance you wouldn’t mind receiving for Christmas! Love it! This would have to be eaten on a cool setting! Forget the ironing… just eat!